A quality family drama can be a greatly effective play because everyone in the audience can relate in some aspect. Geoffrey Nauffts’ new dramedy, Next Fall, has many entrance points of reliability. Not everyone in the audience will relate to the homosexual relationship at the center of the play. Not everyone will relate to the various religious stances held by the characters in the play. What everyone will relate to, however, is the common denominator of religion in our lives and how it influences our views. Patrick Breen plays Adam, a man approaching the edge of middle age, who is a cynic and holds no stock in religion. Patrick Heusinger plays Luke, a 20-something optimist who never begins a meal without a Christian prayer. The audience is privy to crucial moments in their five-year relationship through flashbacks, while a hospital waiting room stands as the play’s main hub, where Adam and Patrick’s friends and family converge after a serious accident. We see how the two have made their many differences work over the years, and which ones have gotten the better of them. Although it doesn’t reach the heights of August: Osage County (the last great family drama to hit Broadway), Next Fall is a poignant, relevant work that highlights some of America’s most pressing issues. Most importantly, it has a lot of heart, and that it is an original piece is incredibly refreshing. The most crucial element of this play is the relationship and chemistry between Adam and Luke. Breen and Heusinger are mismatched—Breen is thin and pale with a nerdy disposition, while Heusinger is handsome and athletic. The physical differences of the actors further highlight the love that they both portray on stage. These two do not look like they belong together, and as we learn their idiosyncrasies and beliefs, it’s further proof that their relationship shouldn’t work. But it does, and beautifully tender scenes staged by director Sheryl Kaller lay the foundation that the story couldn’t survive without, including a quiet moment where Adam and Luke lay on a couch. Breen is the strongest in evenly fleshing out his character. His Adam is comically cynical, and irritatingly so sometimes. He has a distrust for life, but it slightly fades away during his intimate moments with Luke. It is then that we see what Luke provides for Adam. It isn’t as clear how Adam benefits Luke. Heusinger plays Luke like an overeager puppy—not a poor acting choice, as it helps to highlight the differences between these two men. Heusinger is loveable and comical, particularly in his laissez faire attitude in regards to the contradictions his lifestyle has with his religion. Yet at times it seems that his relationship with Adam instills fear in him—the opposite of what happens with Adam—especially when faced with the notion of revealing his lifestyle to his family. This unbalanced dynamic in Adam and Luke’s relationship may have been intended of Nauffts, but it makes their relationship feel just that: uneven. The supporting players are pretty strong, but maintain a sense of extremeness that seems to carry the play’s comedy, which can become annoying. Connie Ray as Luke’s mother Arlene is a Southern whirlwind of hysteria and motor-mouthed speech. She’s undoubtedly one of the most memorable aspects of the play, but a certain amount of realism is lost with that. Maddie Corman as the guys’ best friend Holly is pleasant and endearing in her loyalty and pulls off some great laughs as well. Unfortunately, she develops into a tired New Yorker cliché, which again detracts from the realism—she talks way too much about her apartment. The supporting men are as uneven as can be. As Luke’s staunch, rugged father Butch, Cotter Smith nails the type of father that would instill the fear in his son of revealing who he truly is. Then there’s Brandon, played by Sean Dugan. I honestly can’t say exactly who his character is. He’s not a great friend of Adam and Luke’s, but he used to be in their social scene… and now he’s at the hospital for what reason? I don’t believe this is any fault of Dugan’s; Nauffts dropped the ball with this character. The role of Brandon could be deleted from the play and the story would remain intact. Next Fall relies entirely on the writing and acting; there aren’t many other creative aspects the show rides on. Wilson Chin’s set design is simple: a hospital waiting room and Adam and Luke’s apartment. What is interesting about Chin’s set is the way it transitions, with ledges, shelves, and doorways pushing in and out of the set walls. The effect is similar to drawers pulling out of a dresser. 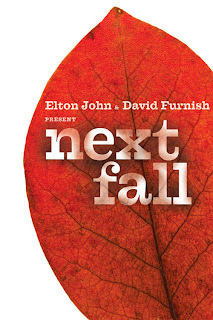 Next Fall is a smart play that attacks important issues covered every day in the media. Its focus on important themes is commendable and the play is sweet. However, the emotional level didn’t reach its height for me that I imagine the playwright intended it to. For me, it may have been because the actors themselves didn’t seem to be experiencing that same emotional climax. Throughout the play, I kept wondering why the characters seemed so non-chalant about the serious circumstance. It kept the play’s emotional wave from reaching it’s full potential. Nevertheless, original and smart are qualities that should put people in the seats. Editor’s note: I did not rush Next Fall, I purchased my ticket through TKTS. The show does have a student rush policy: two hours prior to the performance, two tickets per ID at $26.50 each. Thanks so much! That’s the best thing I could hear. So glad you enjoy, and thanks for taking the time to comment!